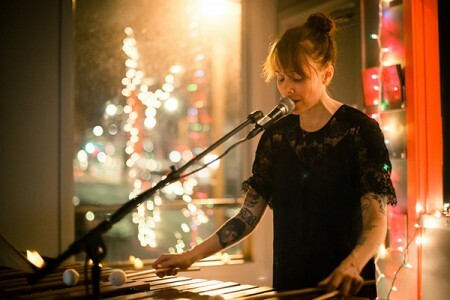 Artist/musician Erin Jorgensen creates a sound world that is part yoga nidra, part punk rock. Inspired in part by Laurie Anderson, death metal, JS Bach, and late-night airwaves, her music conjures up a musical palette with lots of space for the listener to fill in the blanks. Using a five-octave marimba, both acoustic and amplified, with intimate vocals, backing electronics, and stream-of-consciousness thoughts, her soundscapes are ideal for closed eyes, 3 AM thoughts, and dreams. Erin Jorgensen is a musician who half-heartedly studied classical percussion until forging her own path in pop, rock, and performance art. Based in Seattle, she has created artistic collaborations with musician/producer Steve Fisk and guitarist Brett Netson (Built to Spill, Brett Netson and Snakes). She currently creates surreal pop records and soundtracks for people who have a difficult time on planet Earth.